A new report from the World Bank Group warns that climate change will interrupt our world as we know it. In addition to making progress against extreme poverty more difficult, the changing climate "will affect human and natural systems in many ways, disrupting food and water supply, exposing them to deadly heat, destroying infrastructure, flooding homes, changing infectious disease vectors, eroding livelihoods, and decreasing economic opportunities, especially in agriculture". 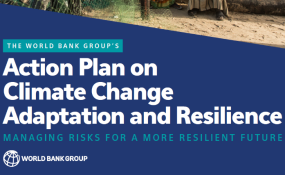 At the report's launch at World Bank headquarters in Washington DC, the organization announced a commitment to make $50 billion available over five years for #climate adaptation and resilience. Bank Group CEO and acting president Kristalina Georgieva (@KGeorgieva) said that weather and climate-induced disasters cost a staggering $220 billion in 2018, underscoring the need for private and public investment in adaptation and resilience".